I Can't Escape was my first One Game A Month, and by far my most successful one in terms of popularity and number of hits. Since I knew I wanted to participate in One Game A Month at the end of last year, I had actually started planning I Can't Escape in December of last year - so while the actual development didn't start until the beginning of this year, I had done the planning and team recruitment for the project in advance, and that extra planning definitely made a big difference. The actual gameplay for I Can't Escape was deliberately small, making it possible to complete in a month's time, and that simple gameplay made it easier to break player expectations and create the eerie atmosphere that made the game so successful. 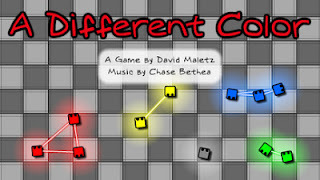 A Different Color was my second game, and also had much less time for development since my original idea for February ended up being too large to do in one month. The goal for this game was to make something simple that had a strong message, based on some of my own experiences in life. It was short and didn't reach as many people as I Can't Escape, but those it did reach seemed to like it a lot, and many people seemed very touched or saddened by the story. There were also people who didn't like the message or misunderstood it, but that's expected for a game like this. I certainly touched upon some very sensitive subjects with this game, but that was my goal. Trip Through Time was my third game, and in my opinion a failure. I was trying out new genres without the proper time or research, and the game mechanics didn't turn out as fun as I thought they would. This happens a lot in game development - sometimes when you finish that early prototype, you have something immediately fun, but more often it ends up not being as fun as you imagined or requires a lot of tweaking and redesign. With enough time, tweaks and improvements, perhaps I could have made this game a success, however, sometimes it's best to return to the drawing board and move on (which is one thing One Game A Month helped me learn). Deus Shift (2011-2012) took me over a year to complete and was redesigned from the ground up three times (with lots of scrapped code and assets). While the game is now fun and well balanced, it took way too long and is still missing some important features (like a good tutorial or campaign mode). Would it have been better to have scrapped the first Deus Shift prototype and tried out three new games ideas instead of redesigning it three times? Rhythos! Arcade BETA was my fourth and final One Game A Month, and perhaps my most ambitious in terms of gameplay features. It was a redesign of the game that I postponed in February, and is basically a twitch/rhythm-based RPG battle system with a ladder of enemies to progress through. 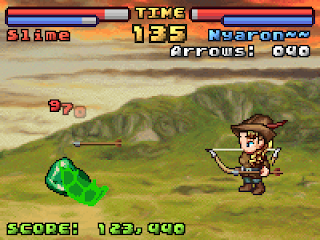 Rhythos was my second most popular One Game A Month, and as you may have guessed, what spawned Rhythos RPG Builder. I wanted to create a full RPG using this battle system but obviously couldn't do it in a month, so I planned to crowdfund an open source RPG Builder to allow myself and others to make RPGs with this battle system. Rhythos RPG Builder was then created, and I fixed up an old tile map editor I had worked on in the past and added the Rhythos battle system to it. However, the kickstarter did not reach it's funding goal, and work on Rhythos has been postponed indefinitely. The reason could be that I didn't market the editor enough, or simply that it was what I wanted, and not what other developers wanted (a lot of comments were that people wanted a more traditional turn-based battle system). Finally, I think that it's tough crowd-funding an Open Source project, as if the project is successful, everyone gets to use the editor, not just the backers. If I had a strong community behind Rhythos from the start, I could have overcome this problem, but I jumped into crowd-funding the project a few weeks after Rhythos! Arcade BETA and without any strong plans. This was still a good learning experience however, and I do want to go back to Rhythos RPG Builder eventually.